Katra (Jammu) October 12 - The Navratra Festival 2010 being organized by Shree Mata Vaishno Devi Shrine Board and J&K Tourism Department in collaboration with various local organizations entered into forth day on Monday. An attractive procession reflecting different facets of rich cultural heritage of the state was taken out from Asia crossing Katra last evening. Minister for Higher Education, who was the chief guest on the occasion, lit the Sacred Jyoti before the start of colourful procession at Asia chowk. The procession after passing through main locations of the holy town culminated at Higher Secondry School Katra. Various Jhankies like traditional Kud by Khem Raj & Party, Itarsi Band, Bharat Mata, Jarian, Bakerwals, Dukandari, Jater and various scenes from Ramayana and Mahabharata were the main attraction of the procession. Different scenes of the Jhankies were so tastefully decorated that no one could resist himself to give repeated applause and slogans in praise of goddess Durga. 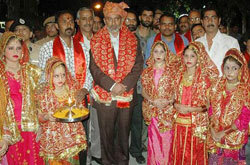 Among others, District Development Commissioner Reasi, Director Tourism, Assistant Commissioner Revenue (Nodal Officer Navrata Festival Katra), Assistant Director Youth Service and Sports, Members of the Navratra festival committee, prominent citizens, large number of pilgrims and local people were present on the occasion. In All India Devotional Song Competition being organized at Yog Asharm Katra as a part of Navratra Festival, Mr. Vivek Mohan of Jammu directly entered in to Mega final of the contest to be held on October 16, 2010 by winning first prize. Similarly Mr. Sanjeet Kumar of Katra got second prize and third prize was shared by three contestants namely Mr. Anil Saroop, Mr. Raju Vijaypuria and Miss. Anju Shah. 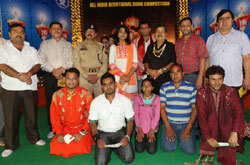 A view of Artists participating in Singing Competition during Navratra Festival - 2010. The Minister said that the festival, especially the Bhaint Competition provides an opportunity to the talented youth from with in and out side the state to show their ability on a common platform which further boost them to show their singing capacity at other events of bigger canvas. Terming the cultural procession being taken out daily during Navratra Festival at Katra, as a real icon of culture and traditions, the Minister said that the event is playing a great role in acquainting to the people in general and pilgrims visiting the holy shrine of Shri Mata Vaishno Devi Ji in particular about the diverse culture of the state. 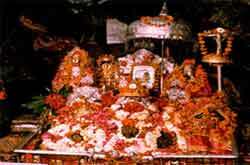 Read more information on Navratra Festival at Katra, Jammu. View Photo Gallery of events during Navratra Festival.